Every industry has its own language and dialect. After starting work at Resource Services it didn’t take long before I started hearing things like “plenum”, “SEER”, and “manometer”. Today we are going to investigate another one, “AFUE”. It turns out that AFUE is actually pretty important, especially if you are in the market for a new furnace. AFUE stands for Annual Fuel Utilization Efficiency. It’s a rating that represents the season-long average efficiency of a unit including the fossil fuels it burns. The higher the rating the higher the energy efficiency. For example a furnace with an AFUE rating of 90% will produce approximately 90% of useful energy with the remaining 10% escaping through the exhaust. An all-electric furnace may have an AFUE up to 100%, however the costs of electricity in some areas may not make it the most cost effective choice for your home. Please note that AFUE only covers the energy a unit outputs at its source, it does not take into consideration the energy lost through ducts and piping. In some cases as much as 35% of the energy output can be lost when the ducts are located in partially or unconditioned areas like an attic or garage. This is one of the reasons why MidAmerican Energy requires SAVE Testing to be completed and passed before they hand out those lovely rebates. SAVE Testing determines if your entire heating system meets the energy efficiency standards, not just the new unit. 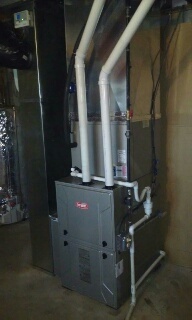 We’ll be talking more about SAVE Testing in a later post, but if you want to learn more now check out www.hvacsave.com. Currently the legal minimum AFUE rating is 80%, however, this may change due to a Department of Energy ruling scheduled to take place sometime this year. At that point the minimum AFUE ratings may vary depending on what region you are in, possibly raising to 85% or 90% here in the North. Don’t worry, we’ll provide updates as things change. In the meantime, keep in mind that the current Energy Star AFUE requirements for gas furnaces are 90% AFUE or greater in the South and 95% AFUE or greater for the North. The U.S. South includes: Alabama, American Samoa, Arizona, Arkansas, California, Delaware, District of Columbia, Florida, Georgia, Guam, Hawaii, Kentucky, Louisiana, Maryland, Mississippi, Nevada, New Mexico, North Carolina, Oklahoma, Puerto Rico, South Carolina, Tennessee, Texas and Virginia. You can also get an idea of the efficiency of an existing system by looking at the equipment features. A low efficiency unit will have combustion gases vented by a natural draft, a continuous pilot light, a heavy heat exchanger, and an AFUE rating of 56%-70%. A mid-efficiency unit will have combustion air and gas flows controlled by a venter fan, no pilot light due to an electronic ignition, will be lighter and smaller, a flue pipe with a smaller diameter and an AFUE rating of 80%-83%. High efficiency units will have a second heat exchanger for condensing flue gasses, providing additional efficiency, sealed combustion, and an AFUE rating of 90%-98.5%. So let’s talk pricing for a moment, a mid-range mid-efficiency gas furnace with an 80% AFUE runs as low as $2,400.00* installed and a mid-range high-efficiency furnace with a 95.5% AFUE runs as low as $3,400.00* installed. That’s a difference of $1,000.00, so is it worth it? Absolutely. Especially once you take into consideration the current Iowa Mid-American Energy rebates of up to $900 on high-efficiency furnaces with AFUE ratings of 95% or greater and the overall energy savings over time. With the rebates it’s definitely worth it to make the bigger investment initially and get the high-efficiency unit. *The above pricing is for a mid-range model gas furnace and installation and does not include taxes. Prices vary and may change at any time. Do you have any more questions about AFUE or how to save energy in your home? Please ask or comment below.